The Bannerfix consists of 2 casted aluminium base plates and 2 fiberglass banner arms. One set always consists of a top arm slightly canted up and a bottom arm slightly canted down. Your banner is always perfectly tightened between the two brackets. 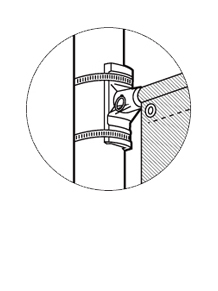 The Bannerfix is a universal bracket for installation on all kind of lamp standards. Bannerfix is easily installed with the supplied “captured” screw-gear stainless steel straps. Especially interesting to use at parking lots of supermarkets, large avenues, shopping streets, etc in cities and municipalities. This system is perfect to draw attention to events, festivals and temporary promotions.